Youdoo Dog prides itself in being the first ever make-your-own dog kit in the world, helping folks who have always longed for the ideal pet but do not have the living space to accommodate one. Each Youdoo Dog arrives as a blank puppy with no face printed on their cute canvas head. This allows the new owner to create their very own unique (and extremely well trained!) 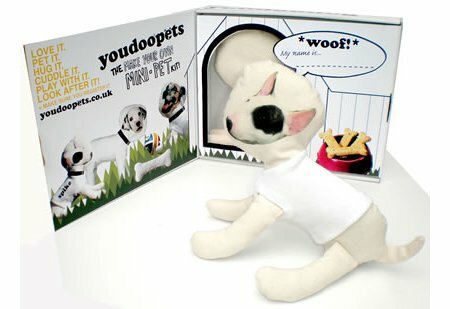 Youdoo Dog, simply by using the transfer sheet, collar and t-shirt, all of which are included in the box. The Youdoo Dog is the first in the line of Youdoo Pets, with cats to follow shortly. In the words of Shaw Taylor – ‘keep em peeled’. The imaginatively-named Youdoo Dog can be yours for £9.95. At least there’s no poop to clean up after.